My name is Donovan Isom, and I played QB for Destrehan High School. I have now signed to play football at the University of Utah. LAFM: Any notable statistics this past high school season? I had over 2600 passing yards, 33 TD passes, 8 rushing TDs, 477 rushing yards, only 2 INTs, and completed about 67% of my passes. I was First Team All-District, District MVP, riverparishfootball.com MVP, Honorable Mention for State, and First Team All-Metro. LAFM: Favorite football player of all time? Why? Michael Vick. He inspired me to become a QB . I have followed him since he was in college. He can expand the play better than anyone. He is a great passer, and understanding QB. He is just a great QB overall and been outstanding ever since he came to the NFL. LAFM: You are committed to the University of Utah. What other schools were next in line if you had to say 1-3? It was pretty much Utah and Tulane. Other schools recruited me but none were as serious as those two. When Utah came into the picture in the spring, it was really just them and Tulane. Tennessee did show some interest after the season and a few others asked for my film. LAFM: How did you first become connected with Utah? To be honest I am not exactly sure. I know Coach Johnson, who was Utah’s QB coach at the time, came down during spring ball. He asked our coaches if their was anyone he needed to look at. I was one of the names mentioned. He watched film of my junior season. He came out to a spring practice, and I had one of my best practices ever. I was slinging it all over the field and it may have been the best practice I had in the entire spring. I did not even know he was their. Later on that night they offered me. LAFM: Why did you choose the University of Utah? The University of Utah is a great place to be. It is a great place to go to college. I have been out their twice now. It is a beautiful city and campus. The university has great academics.They have the field I want to major in which is communications. Football wise, they run a spread offense. I love the Spread and will fit in perfectly with their offense. I really liked Coach Christensen (OC) and Coach Whittingham (HC). I got a good connection with some of the players on the team. I felt like it was just the perfect place for me. I really liked talking with coaches and hearing them explain their school and their football program. I enjoyed some of the bonds I made such as the one with Coach Johnson (he is now at Mississippi State). It is all about what you are most comfortable with and which school is going to benefit you. LAFM: Who are some people that stand out as major factors in choosing the Utes? My mom really stands out. She told me that she was with me in whatever I chose. She said if Utah was the place you want to be at then so be it. 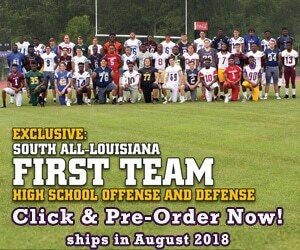 I talked to Coach (Stephen) Robicheaux and my QB Coach, Daniel Luquet. Coach Luquet helped me a lot through my high school years and struggles. Really all of the coaches helped me throughout my entire time at Destrehan. When I came back from Utah, they all supported me and backed my decision. LAFM: What do you bring as a player to the Utah football program? One thing I can say is that they are getting a hard worker. I work hard each and every day. I am going to be in the film room all the time learning what I need to know for every game and what the coaches want me to know. I am a good leader who makes sure everyone is on top of what they should be doing. I always do the best I can and help others do their best. I would probably say my footwork. I will say their is a lot of things I can improve on and plan on improving. In the Pac-12 the game is going to be 10 times faster. Improvement will come with repetition and practice. As soon as I get up to Utah, I am going to get better every day. So I would have to say footwork and catching up with the game speed. LAFM: What are you most excited about going into next year and playing football for the University of Utah? The whole process of everything. Going to school, meeting new people, and starting football again. I cannot wait to start practicing and summer conditioning. I am ready to build a great bond with my teammates and coaches. I would say be careful about what you hear and what you are about to hear. Make sure what you hear is the truth. Some of these coaches can tell you what is real and what is not real. At the end of the day, be true to who you are. Ask yourself if this school is going to be benefit me, my future, and my family. Another thing is make sure your grades are right. The first thing a college recruiter will ask is about your grades. We have a lot of talented people in Louisiana who will not be playing ball next year simply because their grades. LAFM: How did Destrehan High School prepare you for college and for playing football at the next level? Destrehan does a great job preparing you for college. They make sure you do your homework and everything. I want to give a shout out to my teachers who made sure I did everything I needed to do for my grades. They helped me in every way possible. For football, our conditioning program is top notch. It is testing to say in the least. Our coaches put us in the best position to win games and develop us to the best of our abilities. Look at some of these guys we have going to college this year and next year: RaeJuan Marbley (2014, Tulane Commit), Kirk Merritt (2015), Alfred Smith (2015), Will Mathews (2015) and a bunch of other guys. I am really proud of our team and the great talent we have on it along with the great coaches.